In which Jack reviews her new favourite book and admits that she has been stalking the mailman in the hopes her book will come faster. Third, this review is late, but I've had a busy - month so far. The story was slow paced until almost the end. Normally when this happens I get board and toss the book aside. (I like adventure and excitement and battles and danger.) This book didn't really have that. But the writing style and characters made up for that and I kept going because I liked to be with them. Also, usually in slow stories, the end battles turn out to be boring. (I've not read Twilight and have no plan to, but those who have talked about it and I shall use it as an example. I've seen this in other books but cannot remember their titles.) Some have found Twilight dull and boring and slow - and just when they thought they would get to read a battle - Bella blacks out and comes to after it. Nothing exciting happens. Seraphina is not this way. The battle at the end was heart pounding. The kind of "Keep you in your seat with your nose inching closer and closer into the book," exciting. I loved that battle. 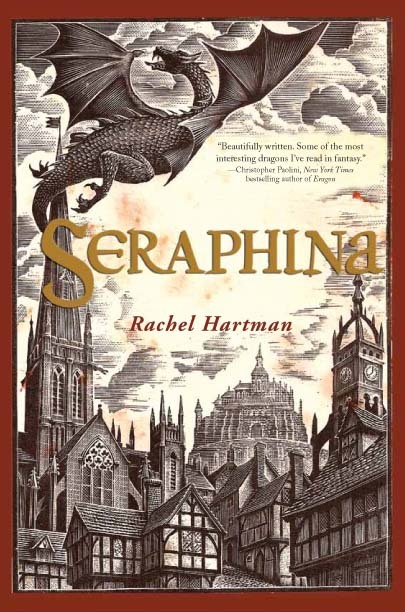 Other things I liked about the book were Seraphina's dragon teacher who was trying to understand humans and muffing it very nicely. I loved his student as well - and was a bit sad over what happened there. There was no love triangle. This might be debated, but I don't think it can really be called one. I mean, Kiggs doesn't even love the other - I won't say more, spoilers. Phina's dad - he does something surprising which I loved. The book is about music, which is very cool. It almost reads like a song, come to think of it. Phina isn't perfect - *gasp*. She has many faults, but in the end tries to do what is right to help those she loves. The book is fat. Usually I avoid fat books, but I didn't mind it this time. I was sad when it was over. There will be a second. HURRAY! There were somethings I wasn't crazy about. There is a bit of language in it. I found it confusing in some places - but I find most things I read confusing so don't judge the book on my word alone. You might find it perfectly clear. Some of the people hint at some crude things, but it wasn't bad from what I remember. That said, I highly recommend this book. It caught me completely by surprise, so much so I am going to buy it when I have the money *HA! * and it is a wonderful adventure. The characters are amazing, even the girl ones. And the girl doesn't fall in love the moment she sees the handsome hero. They become friends first! That one took me off guard. Also, she doesn't hate him either. I know, didn't think that was possible. Anyhow, if you are looking for a good book to read over the holidays while it is bitterly cold and snowing outside, I suggest this one! can't believe you have written so much so quick! congrats!! Yay for you finishing tomorrow!!! I wish I were ... but *shrug* at 13,000 or so words, I might not even finish in time. Saraphina sounds like a great book, and I think my library has it, though I can't say yea or nay on it. I'd have to check. BTW, yes, Sew's trailer is online. The easiest way to find it is to go to my blog, click the official site button (which I have working now) then scroll down. Oh, I liked Leviathan! It gets very exciting in a few more chapters. One of my favourite parts is there - out of all three books. I din't get a chance to comment on your book trailer, though I watched in the day it came out. :) You did a really great job. I loved it. Especially that bit with the fencing. It was good fencing! And the illustrations are awesome. I'm looking forward to when your book's out! 42,332 words! Dang, girl! I'm impressed. 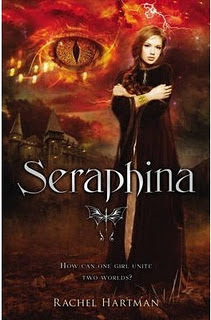 I read Seraphina earlier this year; it's a good story. I agree with you about the cover, in that the first one fits the book a lot better.